Today’s topic as we continue through the book Opening the Gates of the Heart : A Journey of Healing is commitment to the journey. This portion of the verse suggests that we show commitment to the journey by continually looking at ourselves and our life, noting past and present circumstances and events, while remaining open to future situations that we can examine as they occur. We just notice; we do not judge. Instead, we assess our behavior and actions, our thoughts and beliefs. Are they kind and loving, compassionate and tolerant? We look with honesty and an open heart and mind, both of which we have previously elected to practice in order to keep us sober. Then, we commit to the journey despite hard times that may come, for they shall come. That is just how life is. It presents us with difficulties from which we can learn and grow. What do I mean by the second stanza of the verse, that the journey’s reward is in each blossom and leaf along the way? I mean that it is the simple things that occur in our lives that are the rewards as we travel through life. We will find great pleasure in noticing the blossoms and leaves as we journey. There is no “destination,” no end point to which we travel, other than death. Rather, if we notice the small and simple things that occur in our lives on a continual basis, we will gain fulfillment. We just have to make a commitment to the journey. How do you demonstrate commitment to the journey? Do you notice the leaves and blossoms along the way, or are you hurrying too fast, on your way to a destination that when you get there, leaves you feeling empty and incomplete? I would suggest you slow down and notice the little things that abound all around you. That will further your goal of reaching peace of mind. That will help to keep you sober. This is a portion of the verse that accompanies the image of this gate. The verse goes on to say that, despite the rocky or smooth times, one commits to the journey, which is in each blossom and each leaf along the way. In other words, it is in what we discover along that way that holds the journey, not the destination. The destination is not the journey. If we choose to look at the journey itself as the be-all and end-all, life takes on a different tone, a different flavor. Suddenly, we are able to see things in our environment with great wonder and awe. We become more aware of the buds forming in our life as we focus on our journey. It becomes a commitment, a choice, to look at and live in the moment, soaking in what is around us right now. It continues, for we have liked it so well, we thirst for more. We become accustomed to examining ourselves… our actions, behaviors, the ways we have treated people, and the things said to them. This is an on-going and never-ending action that one learns to do in sobriety. It keeps us abreast of how we treat ourselves and others. Armed with that knowledge, we make the choice to set things right, perhaps adjust our behavior and thoughts. It leads to greater harmony, respect, and tolerance. It leads to peace. We commit to this as a way of life, along with seeing the buds and leaves along the way, along with living in the moment, living in this 24 hours. We look at the leaves that have fallen… the past… as it relates to moving us forward. We revisit the past to reflect, to heal, to grow. We use it to keep ourselves moving forward, in the moment. How does the commitment to your journey manifest? Do you commit to living in the moment, to performing a daily self-inventory? How does this work for you? 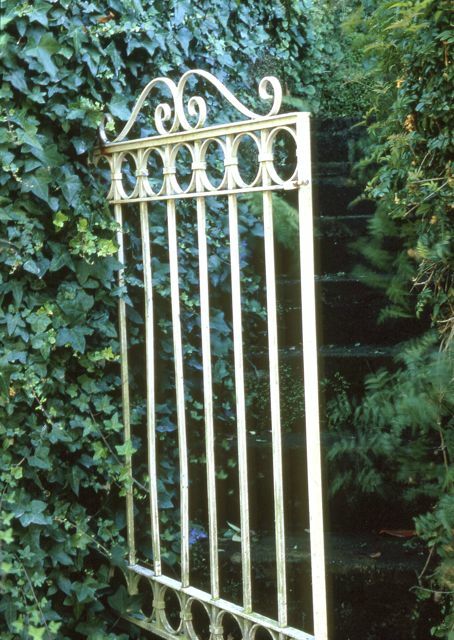 As the author and photographer of her book of wrought-iron gates and accompanying prose, it is said by others that Carolyn CJ Jones’ book offers inspiration and empowerment to those in transition, to those souls in the corner who struggle. View the video about the book, which is located to the right of this blog. Buy the book from Carolyn’s website -receive free shipping and your personally autographed copy. I was prompted to write this as a plea to myself and others during the time I was doing my self-searching. I began to notice the harshness of the people around me. At the grocery store, for example, I noticed parents speaking to their children roughly, with nasty words. No gentleness. I noticed wives, speaking to their husbands with disdain. No gentleness. I began to notice that the way I treated myself slowed down my healing and growing processes. If I’m healing from something which wounded me, for example, being harsh with or belittling myself, etc., does not help me as I try to heal from the original wound. That is just heaping more abuse upon the experience, which hinders the healing process. If I talk to myself gently, however, it promotes the learning and growing. I feel more safe inside myself. I have recently learned to speak gently from within. It took much practice. I had to consciously think about it, remind myself, catch the times I was talking badly to myself. Over time, good self-talk is gradually replacing bad. Why all this talk of myself? Isn’t that just a bit self-absorbed? Ah, but you see, I have found on my journey that the more gentle I am with myself, the more gentle I am with you. The more I love myself, the more I can love you. Isn’t that what this is all about, after all? “The gate stands open, beckoning me to climb. Each step leads further in my journey, offering repeated opportunity to examine myself, my life – the leaves that have fallen, that leaves that will fall and the buds yet to form. The second two stanzas were written in my journal a few years into sobriety. The gate showed up a couple of years later. To join the two, I wrote the first line after I discovered that this prose fit this image. I never knew what a journey was. I did not hang around with people who spoke of their journey. All I knew was I was anxiously flitting from one activity to the next, looking for the one that would make me happy, bring me peace. It was always the end result which was my goal. At some point in my sobriety, I slowed down and began to learn what a journey was. I became aware of how to examine myself, my life, and I began to write about this. I learned to slow down more, to notice the events and experiences that were occurring. I began to understand what people meant when they said that a journey is not a destination, but the process along the way. Over the years, I have gone through a process of healing from emotions such as fear, sorrow, despair. The healing has allowed me to experience enjoyment of the process. I have learned, over time, to notice and appreciate “… each blossom and each leaf along the way,” along my path. Still, I commit to this journey, my journey, because I have experienced the rewards, the beauty in my life when the buds bloom. What are the buds blooming in your life, along your journey? “I look at the ways in which I treat myself and others. Can I allow myself and others to see what I find, to see who I truly am? This is the prose which appears in the book with this image, Welds of Honesty. I wrote these words in my journal a few years before I saw this gate in Taos, New Mexico. I took the picture, only because I thought it had great character. It wasn’t like I was searching for a gate with welds… Later, the words and image just came together. In my life, I have learned to be honest, to not steal, to own up to a mistake I’ve made. I have prided myself on my level of honesty. It was not until I entered recovery, however, that other forms of honesty were presented to me…. being honest with myself about who I am and being honest with others about who I am. What I have found on my journey, is that being honest about who I am is difficult. It has meant getting in touch with all the negative things I say to myself about myself. That evoked a lot of feelings I needed to examine. Then, it involved giving up those negative self-comments, the beliefs that I was a failure, not worthy. These thoughts are not honest about who I am. Yet, even though detrimental to me, I have continued over the years with this thought process because it was familiar. Again, it has taken willingness to change my behavior, my thoughts. And it has involved a great deal of prayer. The reward is a sense of peace inside, an acceptance of myself and all my points, including the good ones, as well as the bad. In what ways are you dishonest about who you are? How do you achieve a level of honesty?